Further proof that I am powered by tea and coffee is THIS ARTICLE in yesterday’s Dominion Post where I was asked to choose ‘my favourite table’, and I chose Stagedoor Cafe. While I am directing your attention to things regarding me beyond this blog…I have a ‘Writer’ page on Facebook which I keep updated with my writing news and links. You can find that HERE. OK, that’s enough of me blah-ing on about myself for one day. 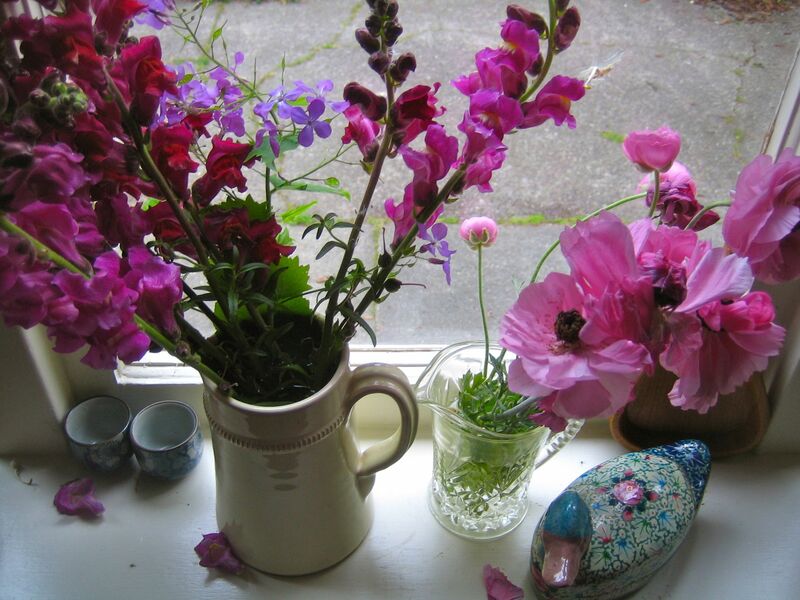 Here is a pretty picture of some flowers – the pink poppies on the right are from my garden, the snapdragons on the left were foraged from some wasteland near our house. Oh, there’s a bit of purple ‘Honesty’ in there, too. I really needed a helen lehndorf top-up in my inbox right then …and now. Thanks Helen!